You can buy a spiralizer for as low $12 bucks on amazon.com, but I wouldn’t spend less than $20 if I were you -it won’t work as well or last as long. This one is by Spiralizer and works really well (It was around $30 down from $50). I got a fancy looking metal one but it didn’t hold onto the counter as well so I sent it back. 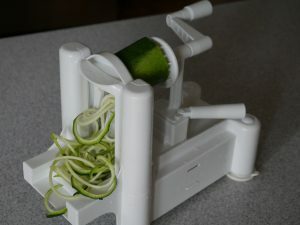 Spiralizing zucchini on my beloved Spiralizer by, you guessed it Spiralizer. 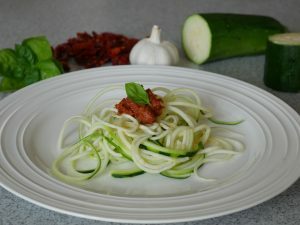 Zucchini is probably the closest you’ll get to pasta in look and feel, so it’s a good place to start if you’re out to trick folks into thinking it’s that white, bleached unhealthy starch too many of us (guilty) are addicted to. Note to self: serve with lots of sauce if skeptics are present. Other great options include sweet potatoes, beetroot (aka beets), carrots and squash. Personally, I would eat any of these raw, but most folks steam, blanch, stir fry or saute them. It’s a great way to use up those veggies that are lying around -as a side dish or entree. In addition to being scrumptious and good for you, it’ll add a whole lot of color and pretty to your plate. 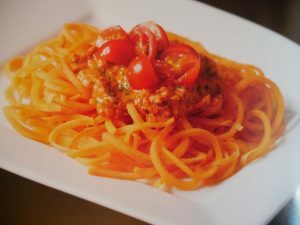 You can have it with regular tomato sauce, sundried tomato sauce, roasted red pepper salt -or if you want a quick delicious dish, sautee garlic in a drop of olive oil &/or butter & a pinch of salt. When it starts to smell incredible, toss in the zucchini linguini. If you’re not a vegan, shave a little parmesan on top. You can add chopped basil for color or just dig in. If using the sweet potato, peel it first. Trim the ends off the vegetable. Spiralize to your heart’s content. Serve raw or steam in the water & salt. You can toss it in the oil or butter if you like or even sautee it.